A hot tub is a fantastic addition to any vinyl deck or patio. With any major renovation adding a hot tub requires some serious consideration and planning. Tuff Industries has pulled together some best practices for hot tub installation on your vinyl deck to maximize your enjoyment. Before you start planning, consider how your new hot tub will be used on your vinyl deck. Will it just be for occasional dips, or for regular entertaining? This will help determine the best placement of the hot tub on your vinyl deck surface – in the thick of things or tucked nicely out of the way. The second factor that will affect where your hot tub is placed is your deck itself. For example, you’ll likely want your tub placed somewhere that maximizes the available view (leaving room for patio furniture) while staying out the wind. Consider as well the areas on your vinyl deck that provide the most support. A hot tub adds a lot of weight to your deck surface, particularly when filled with water. Prior to considering any purchase, you’ll need to carefully assess the load-bearing capabilities of your vinyl deck to ensure it can handle the weight. Talk to a contractor and have them evaluate the structure (while they’re at it they can ensure your deck is in top condition). There’s nothing worse than installing a brand new hot tub on your vinyl deck only to realize that neighbours can see you. Take some time to view your deck from a neighbour’s perspective and invest in a few changes that will enhance your vinyl deck’s privacy. A trellis of vines or some fast-growing bamboo are great choices. Remember that you’ll want any privacy additions to last all year round, so evergreen plants are the best option. 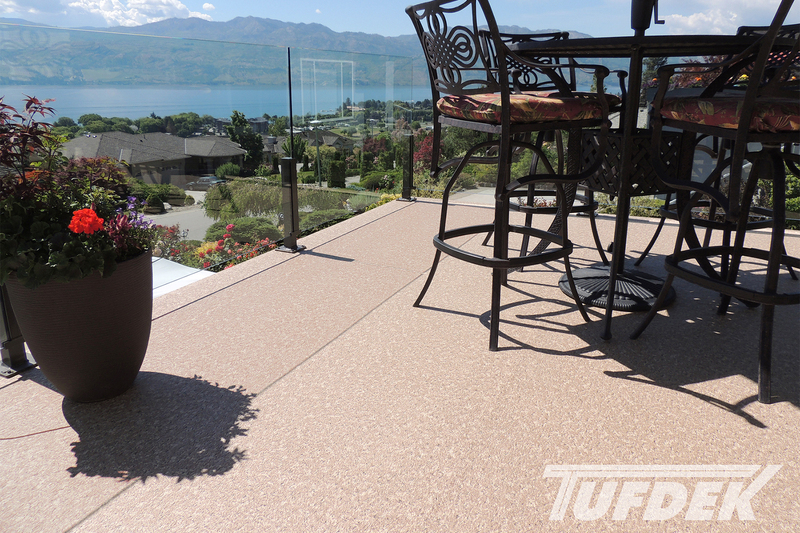 While considering an addition to your deck, it’s a great idea to also upgrade the vinyl deck surface. It will create a cohesive look and establish a long-lasting waterproof deck surface to protect your deck. Changing your deck’s railings can also enhance the look and feel of your deck and improve the view! Once you’ve picked out the ideal hot tub, check out some of Tufdek’s vinyl decking products, or talk to a Tufdek™ dealer about having your deck checked to ensure it can withstand installation.